Do you have ancestry in the Ballarat district? 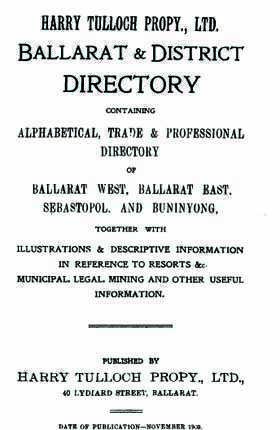 The full title of this 264 page directory is Ballarat and Ballarat District Directory containing Alphabetical, Trade and Professional Directory of Ballarat West, Ballarat East, Sebastopol and Buninyong, together with Illustrations and descriptive information in reference to resorts &c, Municipal, legal, mining and other useful information. Published by Harry Tulloch Prop., Ltd.
Use this unique directory to find both male and female family members. The text on a few pages in the original is faint and in some cases cut off. This may limit the searching accuracy on the pages concerned, but the pages concerned are quite readable on screen. This is a terrific genealogy resource for anyone exploring a family history in the Ballarat district and building a family tree.